Our friends at skiutah.com posted this fun image. I'm dreaming of a white Christmas, and that outcome is guaranteed. A major winter storm is bearing down on Utah and will dump heavy snow over most of the state. If you are traveling, take care. If you are skiing, just enjoy. 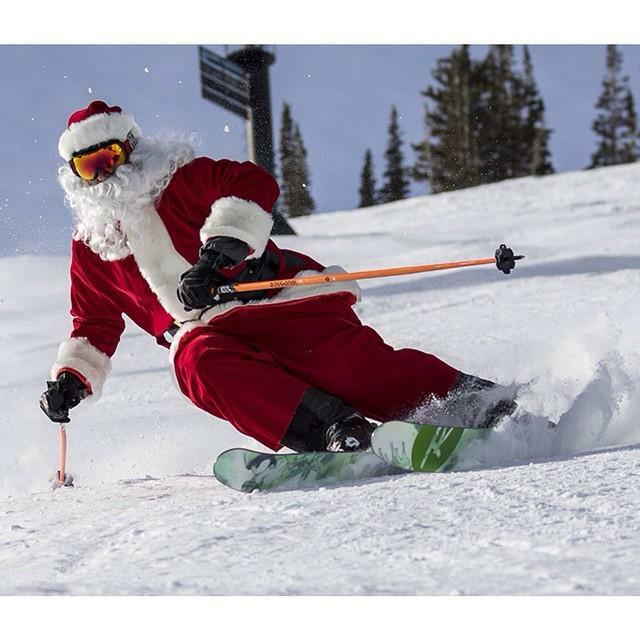 Our ski resorts are open, of course, and you may just bump into Santa and Mrs. Claus. If you venture into the backcountry, be aware that avalanche danger will be high on most slopes. Take care. On Christmas Eve, I enjoy walking through downtown Salt Lake City. Temple Square is aglow with multicolored lights. The square is filled with bustling crowds, and Christmas carols fill the air. It is very beautiful and worth a visit. Away from Temple Square, many clubs are open and are full of cheerful people. As I keep going, and the hour grows later, the sidewalks become deserted and a wonderful silence settles over the city. Snow begins to fall, the flakes sparkling as they dance in front of street lights. The snow adds to my feeling of serenity. At this moment, in this place, with silent snow blanketing the city, it is possible for me to believe that some day we may figure out how to create peace on earth.